The final league game in the Big Bash League (BBL) 2018-19 will be played between the Melbourne Stars and Sydney Sixers. This encounter holds great importance to both these side. If the Melbourne Stars win, they will make it into the knockouts. But, if the Sixers win, they will seal a home semi-final which should be a huge advantage. The Stars’ campaign has taken a hiatus after losses in both the previous two games. Had they won at least one of these games, they might not have placed themselves in this do-or-die situation. The Sixers, on the hand, registered four consecutive wins and they’ll hope to make it five ahead of the semis. 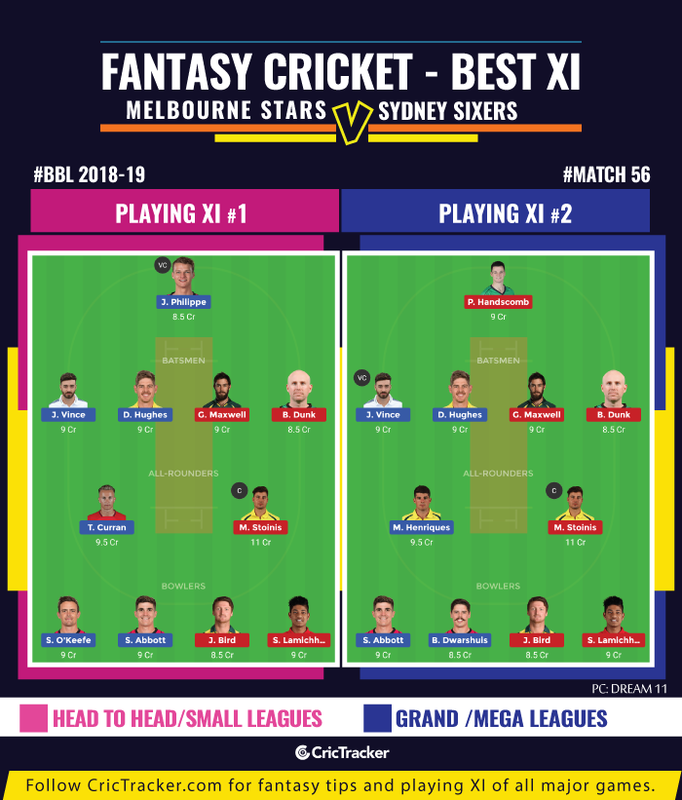 The 56th match of the Big Bash League (BBL) 2018-19 will be played between Melbourne Stars and Sydney Sixers at the Melbourne Cricket Stadium. The match starts at 2:45 PM local time (3:45 AM GMT) (9:15 AM IST). The track at MCG is a slow surface. The ball doesn’t come on to the bat well and patience is the key for a batsman. It is highly preferable to chase as the batsmen will have a target in mind and then they can mould their approach accordingly. Ben Dunk, Marcus Stoinis, Peter Handscomb, Glenn Maxwell (C), Nic Maddinson, Dwayne Bravo, Sandeep Lamichhane, Seb Gotch, Adam Zampa, Dan Worrall, Jackson Bird. Bench – Evan Gulbis, Jackson Coleman. No changes made to the squad. Josh Philippe, Dan Hughes, James Vince, Moises Henriques (C), Jordan Silk, Tom Curran, Sean Abbott, Ben Dwarshuis, Steve O’Keefe, Nathan Lyon, Lloyd Pope/Jack Edwards. Nathan Lyon added to the Sydney Sixers squad for the first time this season. Sandeep Lamichhane returned to BBL after the completion of Nepal’s tour of UAE. 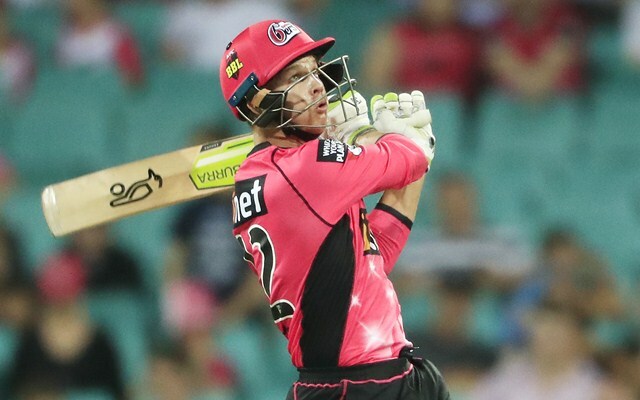 Ben Dunk scored 275 runs from 13 innings in 2018/19 BBL including two fifties. He is the second highest run-getter for Stars after Marcus Stoinis. Bowlers – Steve O’Keefe, Sean Abbott, Jackson Bird, Sandeep Lamichhane. Bowlers – Sean Abbott, Ben Dwarshius, Jackson Bird, Sandeep Lamichhane. Phillipe – 123 runs from last five innings as an opener. Handscomb – 53 runs from last five innings. Not opening the innings. The Sydney Sixers are expected to win the match.